The Indian wedding in the fluorescing Florence in Italy. So, as you know destinations wedding is taking off! It is a trend and we’ve spoken about it many times on this website! 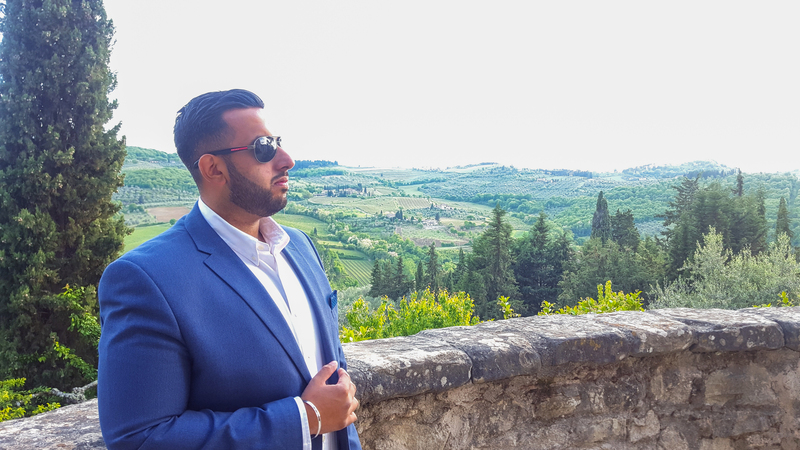 Recently I had the privilege to host and provide entertainment at a magical lavish wedding held in Greve in Chianti – Florence – Italy, for the amazing, loving and beautiful couple Prithpal & Bas Singh. I covered two events Sangeet Party & Wedding Reception. The two nights were themed giving it the extra fun, interesting and incorporating cultures and values amongst loved ones. The Sangeet Party Punjabi was filled with Indian décor etc and the wedding reception was a romantic Italian theme. The best of both worlds! The décor was organised by the caterers and they defiantly did an excellent job, uplifting the events through crops and colours to compliment the events further. I thoroughly enjoyed rocking the decks and having the 180 guests who flew from USA – California and New York as well as the UK! It was a big family reunion and it only gets better when there’s music! So, let’s take it back to the team I was working with. I flew out with Vik from Imperial Drummers, although our flight was delayed and we reached past midnight, the whole experience was out of the world! The sound and lighting were supplied by a local company in Italy. I enjoyed working with the UK and Italian team, at the end our goal was to make the special day a spectacular event! And I can proudly say that we did a fantastic job! There’s obviously no party without food! We were surrounded by the amazing aroma of Indian cuisine. The food was provided by Haveli Restaurant who are based in Florence. Ok, so enough of the features let’s talk about the venue itself, the venue which pulled Prithpal and Bas to have their wedding at. Most of us stayed at the Vignamaggio. Vignamaggio is in the geographical and oenological heart of the Chianti Classico region, 33 km from Florence and 35km from Siena, two of Tuscany’s most important cities. I must admit, the views from this place were incredible. No wonder this was the location and hotel that was chosen, both events were held outside, with a religious Sikh ceremony surrounded by the mesmerising backdrop. I recommend any couples planning a wedding in Florence to check out the hotel and area. You will get the wow factor and amazing pictures! Moving on, the first song which the new couple started their new journey on was Janeman Tum Kamal Karte Ho from the film- Trishul. The two days were packed, especially the wedding day since they had their wedding reception at 6 pm to the early hours of the morning. Nonetheless, the hours didn’t get the best of anybody and all the guests had amazing energy levels to be on that dancefloor all night. I personally cannot wait to go back to Florence to yet again DJ at such prestigious and important days of a couple. Can you beat the location?